TAKETOMI [竹富] island has a population of three hundred and a half, but still claims over twenty MINSHUKU [民宿] guest houses in service. These are mostly “private houses that provide lodging for transient guests,” as MINSHUKU are defined, but if this island thrives on tourism, it also suffers from KASO [過疎] or depopulation, with many of the young people finding their call elsewhere. But one old priest on that little isle has not left that beloved pile of dirt in the sea but once in his life, and that to go to KYUUSHUU [九州] to make a special presentation of 25 of his 2700 display items in his TAKETOMI museum. In his early sixties now & with a moist cough (TANSEKI [痰咳]) and small frail body that betray the poor condition of his health, he explained any and all exhibits that we dared to glance at, and many that we didn’t eye at all. I had for some, time been wondering about the symbolism of tattoos (IREZUMI [入れ墨]) in the RYUUKYUU [琉球] islands, and he was the first to initiate me into the mysteries they hold. On the fingers are YA [矢] or arrows, it being the nature of an arrow to go towards its destination and never return, and therefore meant that the woman on whose hand the IREZUMI [入れ墨] was put, once married, was to stay that way. EIKYUU NI TOMARE [永久に泊まれる] ‘stay forever’ was the audio version of this visual reminder. Then on the knuckles are MASU [升], or ‘rice-measuring square-shaped wooden box’, which were meant to guard against hunger, the skin mutilation being like an offering to the gods in hope of plenty to eat. On that part that everyone knows so well, the back of the hand, an ENMAN [円満], or ‘completeness, perfection, harmony’ is etched in a tattooed full-orb ink moon, signifying a peaceful and harmonious household. What more could one want? Still yet there is another symbol on the TEKUBI [手首], or ‘wrist’, which is an ITOGURUMA [糸車] or ITOMAKI [糸巻] in preference, which means a ‘spool, reel, or bobbin’. It was important for a wife to be able to handle threads. Actually, the expression ITOSABAKI GA UMAI [糸捌きが上手い], or ‘is good at handling threads’, means to ‘be skilled at playing a stringed instrument’. This goes further in the saying ITOTAKE [糸竹], or literally, ‘threads-bamboo’ but means strings and winds, or music. More of this later. This priest had been collecting items for over half a century, beginning even in his early teens to sort and store his childhood playthings. Among these were OSHOUGATSU NO MARI [お正月の毬], or ‘New Year’s balls’ usually made by the mother and given to the children at that festive time of year. They are very colorful, and the priest was proud to tell us that all the colors were homemade dyes right from that island. The ball itself was of tightly wound SOTETSU NO KE KARA DEKITA [蘇鉄の毛から出来た], or ‘made of the leaves of the SOTETSU cycad palm’, which is all over the RYUUKYUU islands. The SO [蘇] part means YOMIGAERU, or ‘be resuscitated’ while the TETSU [鉄] is familiar ‘steel’. This interests me because the first time I heard of this thick stumpy looking palm was when an old cleaning woman told me they used to extract the starch (C6H10O5x), or DENPUN [澱粉] out of SOTETSU and eat it during the war. I only recently heard about this story of a drought-resistant food revolution in Ghana. Modern Ghana reported on 2 August 2012 that “The African Breadfruit Revolution has begun! And it began in Ghana!” Here are a few excerpts. The Ghana Alliance against Hunger and Malnutrition (HAG) announced to Samoan and Fijian news agencies October, 2011 that 870 Samoan variety breadfruit trees, each about 250 mm tall, had arrived to Ghana from a mass propagation facility outside of Frankfurt, Germany. Not since the decades after the mutiny on the Bounty has such a large shipment of the Pacific Islands breadfruit arrived to Africa. HAG made no announcement in Ghana about the project or to where the little trees went for nursery care – the Bunso Agricultural Research Station near Kade – as it was meant to be a bit of a secret until the little trees grew up to field planting size…. The trees are of the Ma’afala and Ulu Fiti varieties of Samoa in the Pacific Islands which produce up to 500 kg of fruit per tree per year and, in Samoa, have complementary fruiting seasons resulting in shorter hungry months. The present Ghanaian breadfruit produces perhaps 250 or 300 kg per year…. You can have your ecoforest and eat it, too! No other tree holds the promise of carbohydrate security that breadfruit does…. The Bunso shipment is believed to be the first large, new variety breadfruit shipment reaching West Africa’s shores since the 1840s when missionaries brought at least one Tahitian variety from the Caribbean to Ghana and beyond. This was just a few decades after the legendary voyages involving the mutiny on the Bounty when other such breadfruit-dedicated voyages brought Tahitian and other Pacific Island breadfruit varieties to the Caribbean. 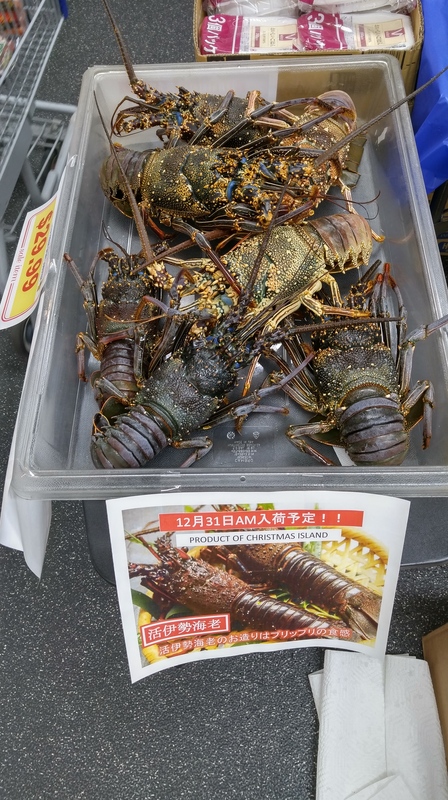 The local branch of Nijiya (‘rainbow shop’) Japanese supermarket in my neighborhood advertised live lobsters from Christmas Island on New Year’s Eve. I’m not sure which Christmas Island they were from (probably the one spelled Kiritimati in Kiribati, where /ti/ is pronounced [si]). The kanji string 活伊勢海老 on the poster gave me some trouble. The character 活 katsu means ‘living’, and the lobsters were indeed still alive. The characters 伊勢 ise presumably refer to Ise Bay off Ise Grand Shrine in Mie Prefecture south of Nagoya (Aichi Prefecture). And the last characters 海老 (which look like they could be read kairou ‘sea-old’) spell ebi (usually spelled in katakana エビ) ‘shrimp, prawn, lobster’, a general name for members of the order Decapoda. The more common name for 伊勢海老 Ise ebi is ロブスター robusutaa ‘lobster’.